Sheffield based construction company J F Finnegan Limited has celebrated a hat-trick of project completions and opening ceremonies for new logistics and manufacturing facilities spanning ‘planes, trains and automobiles’. 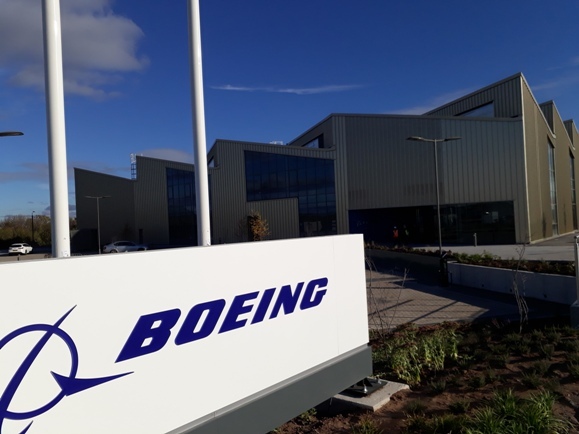 Boeing held an event to celebrate the opening of their first factory in Europe on the Sheffield Business Park. The plant will create spur gears, shafts and housing for Boeing’s commercial aircraft, including the 737 and 767 passenger jets. This statement building will employ approximately 50 people, including 20 apprentices, and has created a host of supply chain opportunities for local businesses drawing on the traditional skills and talents that the Sheffield City Region offers. last Wednesday one of Europe’s biggest rail freight operators, DB Cargo UK, welcomed guests and civic dignitaries, including the Leader of Wolverhampton City Council, Roger Lawrence, to its new Logistics Centre in Wolverhampton. Chief executive, Hans-Georg Werner, spoke about the significance of the facility in bringing renewed confidence and commitment to the area. Earlier this year, a world-renowned formula one supercar manufacturer were handed the keys to their new factory in Sheffield. The facility will manufacture carbon fibre car parts and the client estimated that it will drive £100m into the Sheffield region’s economy over the first 10 years alone. Following construction of the initial building, J F Finnegan are now on site completing an extensive fit-out for the client. Gary Smith, managing director at J F Finnegan, said: “2018 has been a great year for J F Finnegan, not only have we had the opportunity to work on iconic schemes for premium brand clients, but we have played a fundamental part in helping to boost the local economies where we operate.